You've heard me say that Individual investors have little or no impact on the price movement of any real stock. Now, that's true -- a fact of market life. But for some reason, new individual investors seem to view this fact of life as a bad thing. When in reality, this is actually the best part about investing. 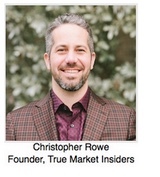 It’s what creates sustainable and tradable trends. It makes it possible for individuals to recognize trends a year or two before they come to an end. And it also makes it possible for investors to pinpoint their limited capital at the strongest parts of the market. The big institutions have actually done most of our work for us before we spend a penny on a trade. All we have to do is simply identify the sectors that seem to be trending. There's almost always some sector trending at any time. So, unlike under-informed investors, we don't fall into the trap of thinking that when the market dips, it means all the opportunities have dried up. We never waste time trying to guess or predict "what will happen next". Instead, we recognize that, historically, once a sector begins trending, the odds say it'll continue trending over the intermediate term -- and possibly over the long term as well. When institutions move billions of dollars into or out of a sector, they’re forced to spread a huge amount of money among a large number of stocks within that sector. The result is that virtually all the stocks in that sector will act in unison -- like a flock of hundreds of birds that all seem to be changing direction at the same time. This process, called sector rotation, is just institutional action behaving like a bull running through a china shop. And it’s easy for knowledgeable individual investors to recognize this process and profit by piggybacking on the resulting move. The question becomes: how quickly are you able to recognize it? Here's a snapshot of part of a tool we use to spot sector rotation in real time. It's from our Sector Prophets premium data program. This "Sector Breadth" tool allows us, at a glance, to see which sectors institutions are buying and selling. Sectors in green show Demand in control (institutions are buying)... Sectors in red show Supply in control (institutions are selling). And we can look deeper into every sector. Here, we see that Healthcare is ranked 11th out of 46 sectors... and that almost 39% of stocks in the sector are on Buy signals. We can even monitor the strength of a sector over different time-frames -- the longer-term (the green oval)... the intermediate term (blue oval)... and the short-term (red oval). 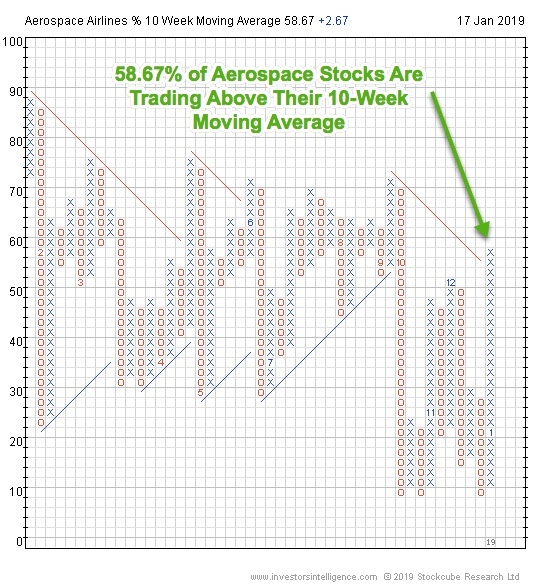 We see (in a useful "Point and Figure" view) that more than half the stocks in the Aerospace Sector are trading above their 10-Week Moving Average. ... which is to identify (and buy) sectors that hold little risk, and are moving higher as institutions take several months accumulating a group of stocks in the same sector. You can either play the sectors by taking bullish positions in Sector ETFs (Exchange Traded Funds), or you can drill down to the strongest individual stock within that sector. (The tools on Sector Prophets even allow you to find the best options for those sectors and stocks.) The choice is yours. But just remember that it’s the institutions that are at a disadvantage in the stock market -- not you. Institutions take weeks or more to get in and out of positions, and have trouble doing so without adversely affecting the value of the asset they are trading. You just have to spot what the clumsy giant is doing and ride the waves it’s making. To get access to these sector tools (plus many more), give us a call at 855-822-0269 and ask about Sector Prophets Pro.